2018 marks the twelfth season for the Canadian NASCAR championship. Pinty’s Delicious Foods continues to be the series title sponsor. In the off-season, there was a significant change in the race format for most venues. The biggest news for 2018 was that races would be split into three segments. Optional pit-stops are permitted between the segments. Not pitting will give drivers at the rear of the field an opportunity to improve their track position. The events at Canadian Tire Motorsport Park and the finale at Jukasa Motor Speedway will be exempt from segment races. This new procedure is implemented to reduce expenses as teams will not be required to employ as many crew members. For the most part, the series schedule mirrored that of 2017. 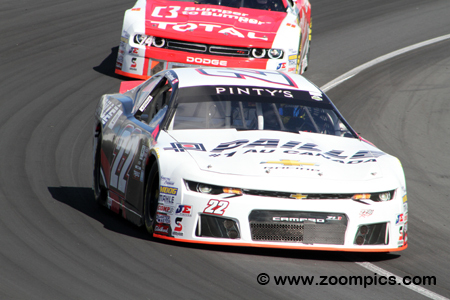 For the seventh straight year, the title chase kicked-off on the Victoria Day Weekend at Canadian Tire Motorsport Park (CTMP) – there would be a second event held in September with the NASCAR Trucks. The championship would end in September at Jukasa Motor Speedway. 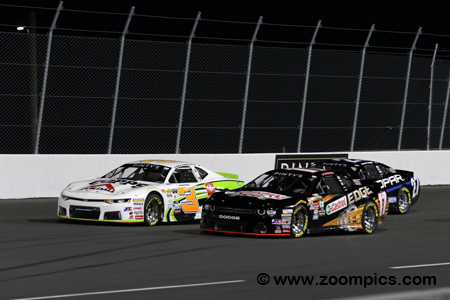 The changes to this season’s schedule included – Jukasa replacing the June Delaware Speedway date and for the first time in the series history competitors would race south of the border at New Hampshire Motor Speedway. In all, the racers would visit ten different tracks in five provinces and one state. The cars competing in the championship are constructed to specifications and rules common to most stock car series. The chassis is a steel tube frame design covered with a fiberglass body and is required to weigh no less than 3000-lbs. Body styles are from manufacturers such as Dodge (Challenger and Charger), Ford (Fusion) and Chevrolet (Camaro and Impala SS). Engine type and displacement are dictated by the make and model of the vehicle. The carbureted eight-cylinder motors produce approximately 550-horsepower. Depending on the gearing, these cars are estimated to have a top speed of 160-mph. The final event of the 2018 NASCAR Pinty’s Series was conducted at Jukasa Motor Speedway. Drivers would be racing around the 5/8-mile semi-banked oval for 200-laps in the Pinty’s Fall Brawl. Four drivers entered the finale with a mathematical chance of winning the title. 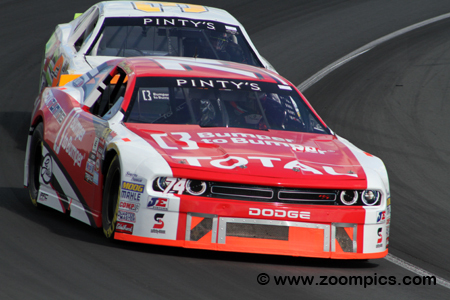 It would most likely be decided between the point’s leader, L.P. Dumoulin and Alex Tagliani. Newcomer, Cole Pole and two series champion, D.J. Kennington had an outside chance of securing the championship. A field of twenty-one competitors started the 2018 NASCAR Pinty’s Series finale at Jukasa Motor Speedway. Pacing the field was the No. 17 Castrol Edge Dodge driven by D.J. Kennington. Sharing the front row with Kennington is Cole Powell in the No. 3 Copp's Buildall / Kubota sponsored Chevrolet Camaro. There would only be two retirees after two-hundred-laps of racing. The driver of the No. 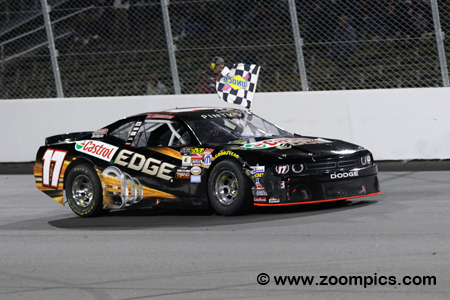 17 Castrol Edge Dodge, D.J. 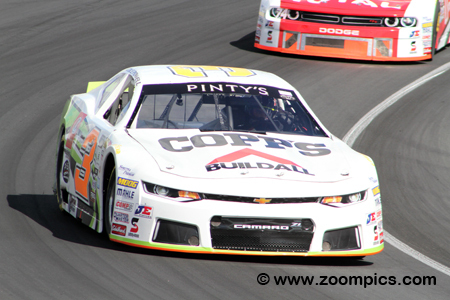 Kennington has competed in every Canadian NASCAR event since 2007. The two-time champion, Kennington has gone winless since Trois-Rivieres in 2013 but that changed Saturday evening at Jukasa Motor Speedway. He started on the pole and took the lead for the final time on lap-174. Despite a challenge from Donald Theetge, Kennington won by 1.462-seconds. There were three first-time winners during the 2018 NASCAR Pinty’s season. One of them was Donald Theetge who scored his maiden victory at Wyant Group Raceway. The driver of the Mercedes-Benz St-Nicolas Chevrolet, who almost won last year at Jukasa Motor Speedway, qualified fifth quickest. 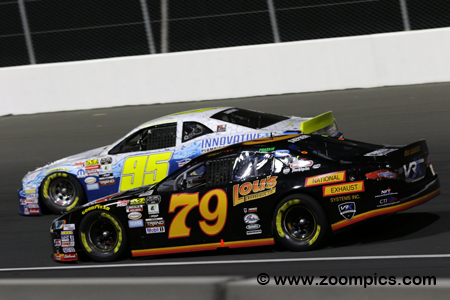 During the race, Theetge led 37 of the 200-laps but had nothing for D.J. Kennington in the end and finished second. After being the series 2017 runner-up, Kevin Lacroix entered the new year as the championship favourite. Despite claiming two victories in 2018, Lacroix appeared to be doomed from the start. He was leading round one until contact with Andrew Ranger took him out of contention and the list of his problems grew (mechanical failures and accidents). At the Pinty’s Fall Brawl, he started and finished third. 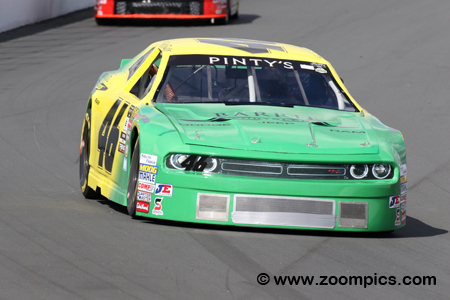 Despite only competing in the Canadian NASCAR series on a limited basis, the local favourite, Pete Shepherd III has a remarkable record. 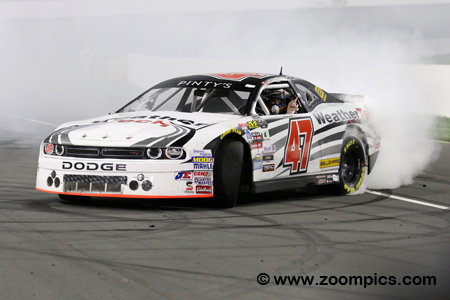 Shepherd's NASCAR career includes five victories – the last coming in 2013 at Mosport Speedway. His most recent accomplishment was a second place in the previous round at Loudon, New Hampshire. In the finale, Shepherd ran with the leaders but the best he good do on this evening was fourth. The 2007 and 2009 series champion, Andrew Ranger won the rounds held at Autodrome Chaudiere and Toronto. Unfortunately, for Ranger, a penalty in the season’s first race and four finishes outside the top-ten left him eighth in the standings entering Jukasa Motor Speedway. He was fourth quickest in the qualifying session. Ranger was another driver that ran with the lead pack and at the checkered flag was in fifth place. Newcomer, Cole Powell driving the Copp’s Buildall/Kubota Chevrolet won round six at Wyant Group Raceway and was one of the four title hopefuls. To secure the championship, Powell would have to win the race while Dumoulin and Tagliani would have to finish well down the race order. 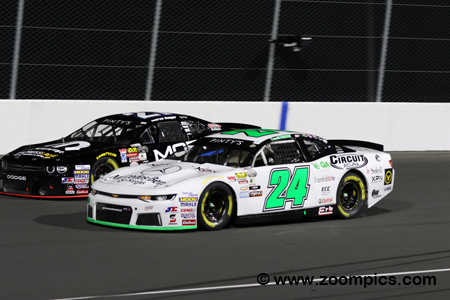 He started the event at Jukasa Motor Speedway on the outside of the front row but was no match for the race leaders and finished sixth. Alex Tagliani entered the final round with two victories to his credit – both of which occurred in the last half of the season. Just four points behind the championship leader, L.P. Dumoulin, he and Dumoulin were the two drivers with the best chance of winning the title. But the championship would not be his in 2018. 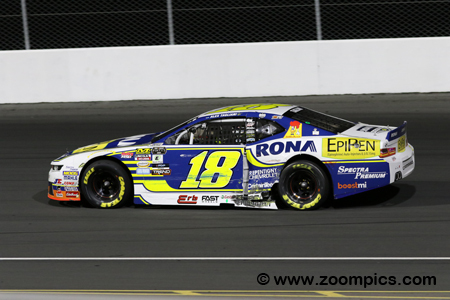 Tagliani fell out of contention early and was involved in a lap-175 incident which ended his title hopes. It was a breakthrough year for Marc-Antoine Camirand. Camirand who drove the GM Paille sponsored Chevrolet scored his first series win (at Autodrome St. Eustache) after competing in the series for six seasons. For the start of the Pinty’s Fall Brawl, he was gridded in tenth place. During the contest, Camirand moved up the race order and was in seventh at the checker. Brett Taylor claimed the rookie title before the season finale. Taylor driving one of the CBRT prepared Dodges competed in twelve of the season’s thirteen races having a season-high eighth-place finish in June at Jukasa Motor Speedway. He entered the final contest of the season tenth in the standings. At the Pinty’s Fall Brawl, Taylor started fourteenth and despite a late race incident with Jason White, he finished twelfth. 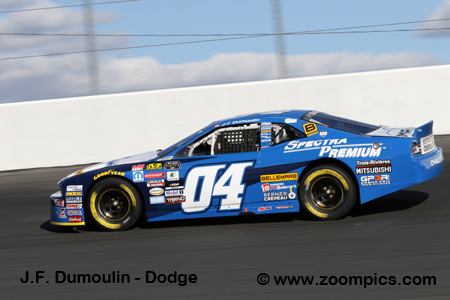 L.P. Dumoulin won the 2014 Canadian NASCAR championship and his best opportunity for his second was in 2018. He entered the season finale with a four-point lead. But his bid for another title suffered a setback when his car was too low after qualifying; Dumoulin had to start at the rear of the grid. 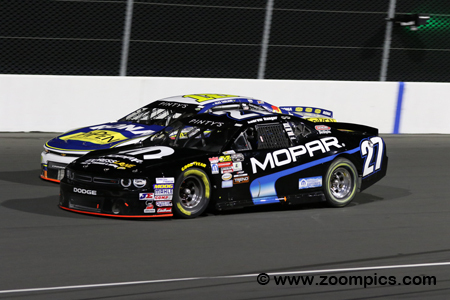 He charged through the field and finished tenth, three-positions in front of Tagliani. Dumoulin claimed his second NASCAR Pinty’s Series title.